MANILA, Philippines - Looking for the perfect wedding dress? How about a sumptuous feast for your wedding guests? Dreaming of dancing your very first dance as a couple to the soothing sound of a quartet? Are you now counting the days til you say “I do”? This coming May, find all the things you will need for your very special day as VRC Creative Events presents Before I Do Bridal Fair 9th Edition which gathers over seventy wedding suppliers who are more than willing to extend their services to soon-to-wed couples and even debutants in making their special day a memorable one. From May 14 to 15, 2011, the Megatrade Hall 1 of SM Megamall in Mandaluyong will be filled with seventy of the finest and most sought after wedding suppliers, as well as those neophytes in the industry, to help out all soon-to-wed couples make that dream wedding come true. Guests will enter a hall dressed up by Full Blooms Flower shop, while DJ Hitman and Andrew Que of Happy Events will play host during the fair along with a number of singers and performers who will keep guests entertained. To better enlighten guests, The Wedding Planner Magazine, Wedding Flavours Magazine, BridalBook.ph and Kasal.com will serve as guide on how to prepare for their special day. Proudly shown on the event’s posters is Nice Print Photography immortalizing a client’s wedding day. With a lot of options to choose from, guests will be treated to a lot surprises and amazing finds in this event, including discounts and special rates for on the spot bookings. These on the spot bookings are also the key to get a chance to 3day 2night stay at 7 Stones Boracay Suites with round trip boat transfers for 2 if luckily picked during the raffle draw at the end of the fair, along with the awarding of Best Prenup Photo Contest winners. As for those still trying to get ideas and have not made a final decision yet on what they want for their special day, they still have a chance to win hourly the onsite raffle items from participating exhibitors. Not to be left behind, the exhibitor who gets the most number of bookings also gets credit and 3day 2night stay for 2 at Panoly Resort Hotel. 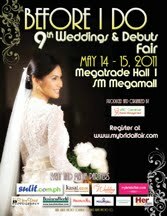 This event is also made possible with the following partners: MyBridalFair.com, Sulit.com.ph, Herword.com, Manila Bulletin, Business World, Megatrade Hall, SM Megamall and MSD Godspeed. Soon-to-wed couples, debutants and guests can get in for free when they pre-register online at http://bido9.doattend.com.